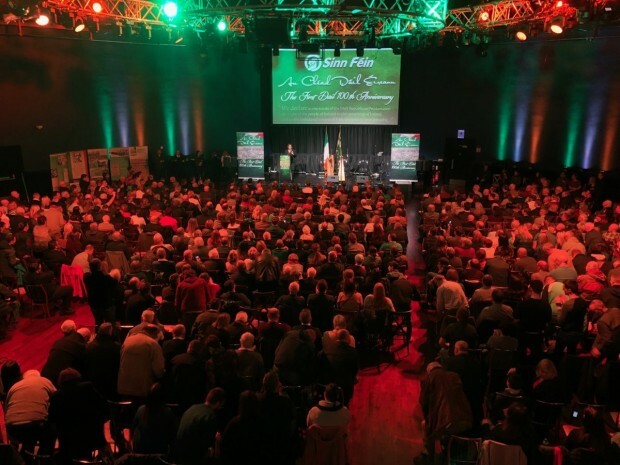 Hundreds of people gathered in the Mansion House in Dublin today to mark the 100th anniversary of the establishment on An Chead Dáil. Republicans from across Ireland marked the centenary in the Round Room of the Mansion House where 100 years ago Sinn Féin TDs met to establish Dáil Éireann as a sovereign independent parliament. The commemoration was chaired by Foyle Sinn Féin MP Elisha McCallion and was addressed by Sinn Féin leaders Mary Lou McDonald and Michelle O'Neill. TDs Pearse Doherty and Caoimhghín Ó Caoláin also spoke at the event alongside membes of Ógra Shinn Féin. The ambush at Soloheadbeg which began the War of Independence was also marked at the commemoration. 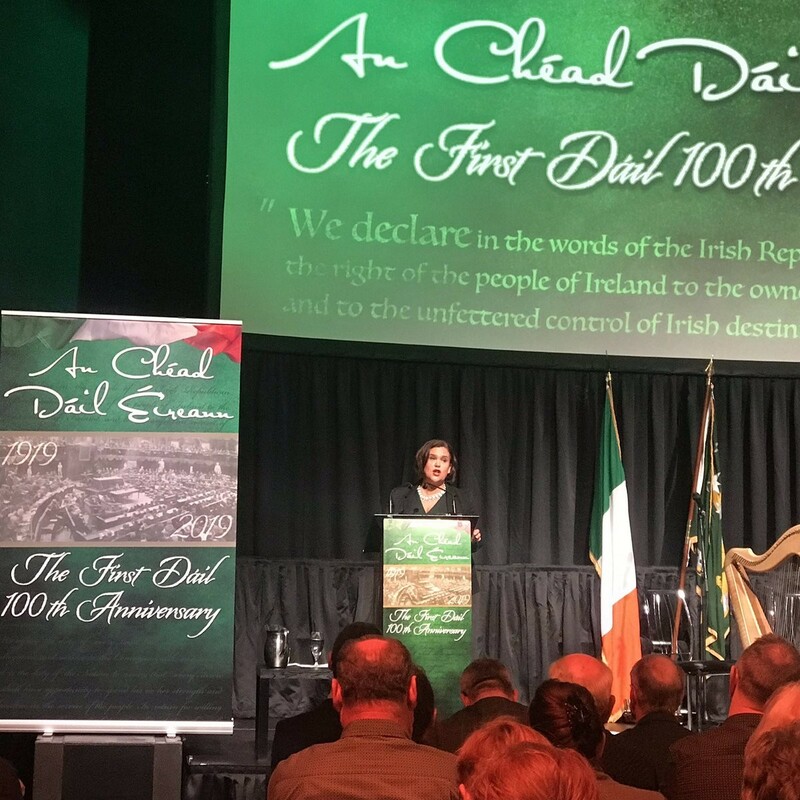 Addressing the large crowd, Sinn Féin President Mary Lou McDonald said today's generation of republicans will complete the work of the Sinn Féin TDs who met in the Mansion House in 1919. "It is time once again to take inspiration from those who broke away from Britain and established the First Dáil. They looked beyond the here and now. They looked to the future. We don't have to accept the system as it is. "What the revolutionaries who set up the first Dáil tell is that we can change the system. A better way is possible. Things can be different but we have to make it happen. A better way is possible. A united Ireland is possible," she said. The Sinn Féin President also said that Sinn Féin in government would deliver a better Ireland. "Sinn Féin will enter government to deliver real and revolutionary change. That means implementing a massive public housing programme to end the scandalous housing and homeless crisis. "It means ending the situation where banks and vulture funds make huge profits in this country while evicting families from their homes. "It means completely overhauling our archaic health system and putting the interests of patients, regardless of where they live or how wealthy they are. above the profiteering interests of private corporations. "It means pursuing the democratic imperative of a united Ireland," she added. Sinn Féin Vice President Michelle O'Neill said the policy of abstensionism established by the Sinn Féin TDs in an Chead Dáil was about sovereignty and added that Sinn Féin is as committed to it today. "We as Irish republicans believe in the sovereignty of the Irish people. We are opposed to monarchies and elites of all kinds. "Those who voted for Sinn Féin in election after election see no disadvantage in our MPs being active abstentionists. Active abstentionism is about energetically representing citizens and providing republican leadership. "It’s about working with those citizens as equals and empowering communities to effectively fight for their rights, whether they are cultural rights, economic, national or political rights. "Sinn Féin has an unparalleled reputation in this regard, and do not let anyone tell us otherwise. "We won’t take lectures from Micheál Martin, Leo Varadkar or anybody else," she said.